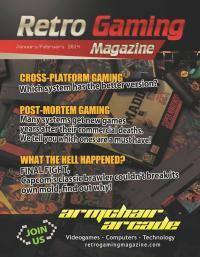 Armchair Arcade Joins the Upcoming Retro Gaming Magazine - Purchasing Options Now Available! Retro Gaming MagazineI'm pleased to announced that Armchair Arcade is officially aligned with the upcoming Retro Gaming Magazine (RGM). Not only will RGM's staff be bringing you great editorial content each month, but so will the Armchair Arcade team--all in the style you've come to expect from us since our founding in 2003. On a personal note, a magazine is something those of us at Armchair Arcade had always wanted to pursue, but for various reasons, including industry volatility, it never quite got off the ground through traditional means. Of course, as many of you may remember, Armchair Arcade itself originally started as an online magazine, which ran for seven issues before we became a general purpose site, with on-demand articles, features, news items, blog posts, forums, videos, etc. That also allowed us time to better focus on other projects, including our popular books and even a documentary film, which should finally see release in 2014. In any case, this is an exciting new chapter in Armchair Arcade's continued evolution and we plan to fully support the RGM team in making the magazine - which is available in print and PDF versions - a success. Click here to see the worldwide purchasing options. You can check out RGM's official Facebook page, here, as well as Armchair Arcade's page, here. Commodore Free Magazine Issue 54 has recently gone live in all of its glorious formats; those being Adobe PDF, Commodore SEQ, Text, D64 Image, HTML, eBook (MOBI and EPUB) and Rich Text Format (RTF)... so there's no excuse not to read it. All kidding aside, this is a fanzine of extraordinary quality and really deserves to be on your "to read" list if you are any kind of self-respecting Commodork. Abandonia TimesGreat news! Abandonia Times has just released their second issue, and it's available now over at The Abandonia Times website. The theme of the issue is "Doom and Horror," and there's a slew of articles on Doom, a history of horror games piece, Noctropolis, and Super Fighter vs. Sango Fighter (heh, remember that one?). There's a lot of meat here, so get over there right now and check it out. From the editor: allow me to boast about the variety of the articles: we have freeware and console reviews, we have history articles, two interviews with two interesting people that marked the gaming industry in their own unique way, and a wide selection of non-DOOM PC game reviews which are at least tangentially related to horror. Issue 50 of the Commodore Free magazine - April 2011, Now Available! The latest issue, April 2011, of the excellent Commodore Free magazine is now available in the usual .PDF, .txt, .seq, .d64, .html, EPUB, and MOBI formats. Get your copy in the format of your choice here! It's time for another influx of retro gaming magazines... This time we have a short lived UK gaming magazine called Micro Adventurer. The series was put out by Sunshine Books and featured a mere seventeen issues between November 1983 and March 1985. Still, it's a great bit of gaming nostalgia and certainly worth adding to your collection. This is the first eight issues in Comic Book Reader <.cbr> format. So, if you don't already have a viewer.. now's the time to grab one. You can also try ComicRack... some people seem to prefer it instead. It's the iTunes of the comic reader world (read: bloated and slow) ;).